The New Directors/New Films series, now in its 36th year at New York’s Museum of Modern Art, has always been touted as a showcase for independent cinema and young filmmakers with experimental aspirations. Infernal Affairs (2002) seems a bit out of place in this year’s program, despite the youth of its director team of Alan Mak and Andrew Lau (cinematographer for Wong Kar-wai’s Chungking Express  and As Tears Go By ). This film did not get its premiere in New York; it has already been one of the most successful films in Asia in recent memory. But there is something decidedly ‘new’ about the direction it takes, for Infernal Affairs is really the most ambitious attempt at high concept, blockbuster filmmaking yet attempted by the Hong Kong film industry. Since the Asian financial crisis of 1997, the Hong Kong film industry’s output has decreased dramatically, with Hollywood tightening its grip on a market once dominated by a wealth of local product. One may detect in Hong Kong a trend toward what Justin Wyatt, in his indispensable book High Concept: Movies and Marketing in Hollywood, has described as ‘high concept’ filmmaking – the blockbuster formula of heavy promotion around a few high-budget films rather than the classical studio era’s assembly line mode of production (1). Recent examples in Hong Kong include the attempt by one of the industry’s most noted director-producers, Tsui Hark, to recapture the magic of his groundbreaking Zu: Warriors of Magic Mountain (1983) with the remake Legend of Zu (2001). An intense marketing campaign promoted the film, but at the box-office it proved an utter failure. Essentially shot with actors against a blue-screen, the film contains an overload of special effects that hardly compare with the brilliant wirework of the original, which revitalised and revolutionised the martial arts genre. Tsui’s most recent effort, a sequel (another usually reliable blockbuster formula) to a film he produced, Black Mask (Daniel Lee, 1996), also failed at the box-office. Infernal Affairs, on the other hand, has had resounding popular success. It is the inaugural production of the ambitious Media Asia conglomerate, a company that previously only distributed films and videos. Released just before Christmas, it met with little competition in theatres (the Hollywood holiday blockbusters Gangs of New York [Martin Scorsese, 2002], Chicago [Rob Marshall, 2002], Catch Me If You Can [Steven Spielberg, 2002] and Star Trek: Nemesis [Stuart Baird, 2002] had not yet been released). It was then available on DVD and VCD in time for the big spending of the Chinese New Year holidays. The first indication to moviegoers that here is a film guaranteed to give you your money’s worth is the abundance of stars, including one actor probably familiar to Western art-house audiences, Tony Leung of Wong Kar-wai’s In the Mood for Love (2000) and Zhang Yimou’s Hero (2002). Leung plays Yan, an undercover Hong Kong cop. Part of an experimental police program to plant young recruits in the Hong Kong triads – who themselves recruit very young – Yan has essentially lived his life as a gangster. Andy Lau, undeniably Hong Kong’s biggest male star today, plays Leung’s opposite, a gangster named Ming who is sent to the police academy as a young man and comes to serve as the triad’s best mole. Shawn Yue and Edison Chen, two of Hong Kong’s hottest young male stars, play small roles as the teenage Ming and Yan in the opening flashback. Eric Tsang, star of many of Peter Chan’s films, plays the triad boss Sam. Anthony Wong, an experienced character actor famous for his offbeat roles (for example, the gangster that hides weapons in a hospital in John Woo’s Hardboiled , the decapitating-device-wielding demon in The Heroic Trio [Johnnie To, 1993], the human-meat-bun eating serial killer of The Untold Story [Herman Yau, 1993], or the hairdresser-bodyguard in The Mission [Johnnie To, 1999]), won the Hong Kong Critics Award for best actor as Superintendent Wong, Ming’s boss and Yan’s contact at the police station. Sammi Cheng, Hong Kong’s highest paid female star, has two brief scenes as Ming’s fiancée. In fact, there is a surplus of stars in this film, with Sammi’s role especially puzzlingly small: not a prominent role, yet not quite a cameo either. Pop star Kelly Chen, Hong Kong’s ‘queen of dance music,’ also stars as Yan’s psychiatrist, and this reminds us that one crucial part of marketing the post-Top Gun (Tony Scott, 1986) blockbuster has been marketing the soundtrack. Infernal Affairs boasts an elaborate orchestral score of the kind rarely deployed in recent Hong Kong film while also engaging in the now common practice of having a pop hit not necessarily used within the film but associated with (or ‘inspired by’) the motion picture. Lau, at least as famous for his success as a pop star as for his film career, collaborated on the film’s pop single with his co-star, Leung, a new presence on the music scene whose first album was ‘inspired by’ In the Mood for Love. The story itself, despite the various plot twists, is a bit thin, drawing upon the theme of the duplicitous gangster/policeman now familiar to audiences from many of John Woo’s films, with Face/Off (1997) the most explicit and ironic take on this trope. But here Leung has no real opportunity to portray the kind of complex internal struggle and vulnerability he could in his similar role as an undercover cop in Woo’s Hardboiled. Nevertheless, his star persona, built from that film as well as his role as a corrupt Macau detective in The Longest Nite (Patrick Yau, 1998) (produced by Johnnie To) – and of course his work for renowned auteurs like Wong Kar-wai or Hou Hsiao-hsien – provides Infernal Affairs with the pre-sold property of the rugged, troubled fringe character. Lau’s character can be recognised as the cool customer type developed in films like Running Out of Time (Johnnie To, 1999), as well as in his music videos, his commercials, and his public service announcements promoting the values of polite customer service to Hong Kong merchants. Until the two headliners finally meet, what really seems to drive the narrative here is appeasing an audience’s curiosity as to which star will be highlighted next. Often characters are talking on their mobile phones, so they aren’t even in the same room – or shot – with each other. By the time you make it through the back-and-forth plot twists, you’re thankful for the entertainment but feel a bit empty, not really knowing where you’ve been, especially with the rather business-as-usual ending (however, DVD owners have the option of viewing the alternate ending required for Mainland China, in which punishment of the guilty is more firmly dispensed). The film at times looks not like a feature film but like a commercial. The soothing blue-green colour scheme is apparent in such images as the rooftop scenes with a rich blue sky in the background, Ming’s shirts, and even Sam’s mobile phone. These soothing colours are one of the film’s most appealing features, suturing the spectator as effectively as a classical Hollywood narrative. Wyatt makes note of advertising’s influence on the high-concept film, enhancing the integration between marketing and film technique. Advertising, he writes, ultimately becomes a “medium of expression [that] is fundamental to the very construction of high-concept films” (2). 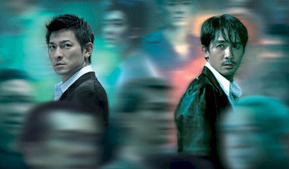 This is evident in Infernal Affairs‘ promotional material: its poster, while not a still from the film, is a composite of recurring images, which echo similar scenes of rooftop encounters in the successful Johnnie To films Running Out of Time (1999) and Running Out of Time 2 (Johnnie To and Law Wing-cheong, 2001). In Infernal Affairs this rooftop scene is a turning point and the film’s emblematic (and marketable) image. When the two stars finally meet (think of the anticipation surrounding the meeting of Pacino and De Niro in Michael Mann’s Heat ) the film’s narrative is put on hold. Time stands still to allow the consumption of this image: the clouds behind the backlit characters move in slow-motion atop one of Hong Kong’s sleek, post-industrial office buildings. As Wyatt writes, “on the level of formal composition the high concept films are linked by a set of production techniques composed of extreme backlighting, a minimal (often almost black and white) colour scheme, a predominance of reflected images, and a tendency toward settings of high technology and industrial design” (3). The clothing of the main characters, as well as the images in one of the alternate print advertisements for the film, provide such black-and-white simplicity, complimented by the deep bluish-green reflective surfaces of the ultra-modern industrial police station or the silver cars and radiant headquarters of the gangsters. Replaced by sleek, impressive production values, gone is the at times vulgar depiction of the working class in Hong Kong action films of the ’80s. The middle-class environment (and projected audience) is epitomised by that most coveted possession in crowded Hong Kong: a new apartment for Ming and his fiancée, its minimalist décor dominated by the high-end stereo equipment purchased from a store controlled by Ming’s gangster counterpart Leung. Ming begins to appreciate fully the distance he has travelled from the dangerous streets of Mongkok to the upper middle-class world of Hong Kong’s Central district when he is invited to play golf with the executives of the police department atop a high-rise building. This scene allows another perfect image, a low-angle shot of the wind animating Lau’s body with the deep-blue sky background, that echoes very similar images in a soft-drink commercial featuring Lau that Hong Kong audiences would likely see (yet again) among the previews before the film’s start. Indeed Lau has come a long way from the role that jump-started his career – as a Vietnamese immigrant in Ann Hui’s The Boat People (1982) – to the current ubiquity of his image in Asia, with appearances in advertisements for any product imaginable and his recent portrayal of middle-class characters in Johnnie To hits such as Needing You (2000). Lau’s career suggests another parallel between Hong Kong cinema’s industrial changes and those of 1970s Hollywood, as he has become a major producer as well. His production company Teamwork Pictures has developed a significant relationship with Johnnie To’s company Milkyway Image, and Infernal Affairs‘ numerous references to the work of To come as no surprise. To has been responsible, either as a director or heavily-involved producer, for many of the box-office successes in the post-1997 Hong Kong film market, and he has emerged as probably the most powerful leader of recent industry trends, with his latest project being funded by Warner Brothers. Unsurprising, then, that To was initially approached to direct Infernal Affairs. Finally, another indication that Infernal Affairs approaches the direction of the Hollywood blockbuster: Brad Pitt and Jennifer Aniston have already acquired the rights to a remake. Being a crime thriller, Infernal Affairs differs from many other Asian films recently acquired by Hollywood studios. A remake of Hideo Nakata’s The Ring (1998) has already enjoyed huge success, while another of Nakata’s films, Dark Water (2002), is also being remade. With remakes of Hong Kong films The Eye (Danny Pang and Oxide Pang, 2002) and Going Home (Peter Chan, 2002) on the way, we’re reminded of another new direction in popular cinema: the horror film is back, with the Asian film industry providing much of the material. And even Infernal Affairs, not ignoring the value of that market, hints at the macabre in its Chinese title, referring to the Buddhist conception of the most horrific level of hell reserved for those who commit the most unforgivable sins, in which one can no longer tell the difference between good and evil. Hong Kong has dominated the film market of South East Asia for most of the 20th century, and Infernal Affairs continues that success. However, following the mainstream international success of Crouching Tiger, Hidden Dragon (Ang Lee, 2000), not to mention the increased employment of Hong Kong filmmakers by Hollywood, this is only further evidence of this once-vibrant local industry’s absorption into the realm of ‘world cinema.’ Given this change in the political economy of international cinema, Hong Kong films – in production values, storylines, and the language of their dialogue – increasingly anticipate a global audience. The screening of Infernal Affairs in New York then is yet another sign of things to come and the need to ponder an international history of ‘post-classical’ cinema. Justin Wyatt, High Concept: Movies and Marketing in Hollywood, University of Texas Press, Austin, 1994. Charles Leary is a Ph.D. candidate in Cinema Studies at New York University.